Mangalore (120km) , Recommended for International travelers as car or bus from here is a much shorter journey than from Bangalore. 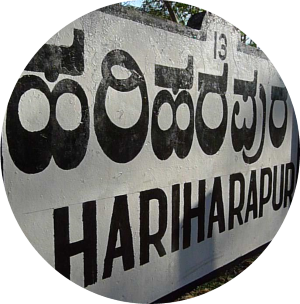 Hariharapura is well connected by bus services from Mangalore, Udupi, Shimoga and Chickmagalur. Luxury KSRTC (www.ksrtc.in) buses destined to Sringeri from Bangalore also pass through Hariharapura. One can make online reservation on these buses sitting at any place in the world. IF requested, a taxi can be arranged from Bangalore, Mangalore or Shimoga to bring you to the centre.